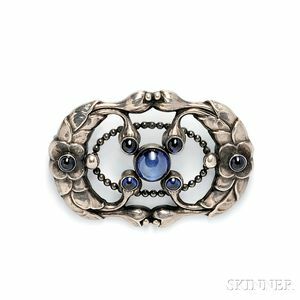 Sterling Silver and Synthetic Sapphire Brooch, Georg Jensen, designed by Georg Jensen, Denmark, 1933-1944 mark, of leaf, flower, and bud motifs set with cabochon synthetic sapphires, lg. 2 in., no. 76, signed. Note: Pictured in Georg Jensen: A Tradition of Splendid Silver, by Janet Drucker, p. 81.